What I would find strange is that Frederick doesn't cheat. He never seems to be a stable person. And I don't remember his story with Mary wrong he was already dating someone else when he started with her. Falling in love with someone while dating another person isn't exactly cheating. Only when you act upon that 'falling in love' it is cheating. I had a relationship with a man, fell in love with a colleague and before I took it any further, I first broke of my relationship. It is very well possible that Frederik did the same and broke off the relationship with his girlfriend of the time (was it Maria Montrell?) before he contacted Mary to arrange to meet at a later date. Frederik never came across as a cheater. More a serial monogamist in my opinion. I have seen that before, men and women dating actively and then they find 'the one' and settle down. I think Frederik is like that. I don't think Frederik has ever ended any of his relationships. He just sort of disappears or get impossibly to reach. One girlfriend send out a press release that she ended the affair, betinna - the girl before Mary -announced in an interview that she had ended the relationship, but that they both agreed on this. I've read too much in RD to not believe that there is something off in their marriage and more precisely in Frederick. Crown Princess Mary today participated in an event in accordance with the 25th anniversary of the Convention on the Rights of the Child. All of the plastic surgery Mary has had makes her face look so incredibly painful. And rightly so. I would be rather disgusted if they would diss the dirt on their former relationship with the Crown Prince. A gentleman doesn't 'kiss and tell' and in light of the women-are-equal-to-men times we live in, a gentlewoman shouldn't kiss and tell either. I am sure that none of the former girlfriends of the Dutch King would be willing to participate in a Dutch project like this either. I know that there are many royal posters throughout the internet who believe Mary to be evil/crazy personified. However, she carries out her duties, dresses appropriately and stylishly, and there are no scandalous rumors floating about. The children seem to be settling down after some bratty periods for some of them. What do posters here think of Mary? This very old thread may enlighten you. I think that here there is more indifference than nothing else towards her. Something does seem off about Frederik. And once again Mary shows up for her engagement, stylishly dressed, well groomed, and enjoying herself. It is ridiculous that Marge allows Mary to wear such a dinky little tiara as the Crown Princess of Denmark. She should unlock the vault and loan her something more appropriate. 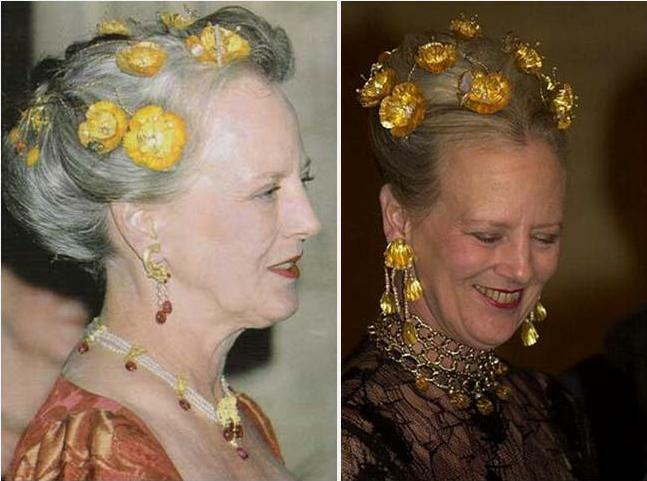 Margrethe doesn't really loan jewels like the swedish or dutch do. Frederick had been given by his grandmother a ruby parure which is the one Mary frequently uses. Moreover they gave her as a present the tiara you mention and a jewel house gave her a modern tiara on loan for life. She has a lot more tiaras than many of her contemporaries. And the ruby parure is magnificent. Yes, I know the ruby parure is an heirloom and valuable, and sometimes it looks lovely, but sometimes it looks odd and clunky. The Midnight thingy looks like feathers and berries. Kinda weird. The wedding tiara looks like a children's tiara. A Crown Princess should have something more attractive, in my opinion. I love the ruby tiara! Maybe you don't like how she reformed it? Because now is more dense. To me Mary has a nice collection: the pearl when she doesn't want to attract lot of attention, the ruby for big events and the midnight when she wants to have something different. The Danes certainly have odd tiaras . . . . . 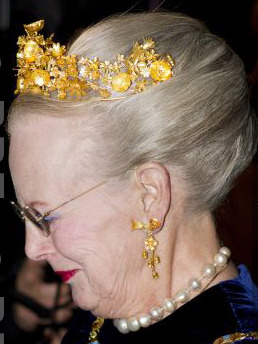 The Swedish royal woman have fabulous tiaras. No feathers or berries . . . . Marie has a nice diamond tiara . . . . The queen has 4 sets of crown jewellery. The ruby parure comes from the sweedish royals who again got the ruby parure from france. The sweedish royals descends from a French general. Thank you, HC. Those sets are lovely. So, the Swedes dumped . . . er . . . gifted the ruby parure to the Danes, eh? Well, nice of them. ^ I will look it up, thank you. A sweedish princess married into the Danish royal family and she got the ruby parure because her mother thought the parure had the Danish colours red and white.